The Turtles throw April a surprise party to celebrate her first anniversary as a reporter at Channel Six News, but April is not feeling very celebratory — it seems that Burne Thompson has suggested that she will not be celebrating her second anniversary if she does not find a story soon. Donatello and Irma rush out to get a special pizza in an effort to lift her spirits. Meanwhile, Krang and Shredder send Rocksteady and Bebop up to the Earth’s surface to locate “a new source of energy generated by the Nuclean Fission Reactor at the University.” But the mutants think that Shredder is sending them “fishing” and when they finally learn their mistake, a bright ray of light, coming from out of the sky, zaps Rocksteady and he disappers. On the other side of town, just as Donatello and Irma are about to enter a pizzeria, the same ray of light “zaps” Donatello, and you guessed it, he disappears as well. Back at the Turtles’ lair, while everyone is concerned about Donatello’s disappearance and Splinter suspects aliens, April is excited at the prospects of a story. Meanwhile, Bebop’s story leads Krang to also suspect that the Earth is being visited by aliens. Somewhere in a parallel dimension, after exchanging insults, Donatello and Rocksteady team up to find their way out –only to be pursued by a terrifying creature. They finally are able to outsmart it, only to have the creature disappear. Back at Channel Six News, April learns that Burne has given Vernon April’s office and has reassigned her as Vernon’s cameraperson. It seems Vernon is onto a story about radiation emanating from the University.. While Krang insists that Shredder go to the Reactor to obtain the new source of energy, Shredder insists that he find the aliens’ spaceship and liberate their weapons, and thanks to Rocksteady’s report, via his communicator, Shredder is about to “teleport” himself onboard when Michaelangelo, Raphael, Leonardo and Splinter arrive at the glue factory (Donatello having lost his TurtleCom when he was beamed aboard the spaceship, rewired Rocksteady’s communicator to contact his comrades). But before they can stop the countdown, Shredder and Splinter are both “transported” onto the spaceship — where they go their separate ways. Splinter rushes to find Donatello while Shredder rushes to find the weapons. They are both successful. 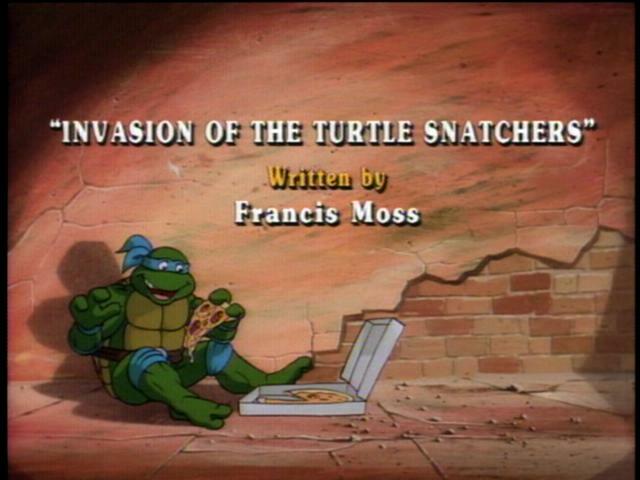 Shredder, using the aliens’ weapons, “imprisons” Splinter and Donatello and transports himself and Rocksteady down to the Nuclear Fission Reactor, where Bebop and the Ninja Foot Soldiers have unearthed the Space Boy’s “toy.” and are engaged in combat when Michaelangelo, Raphael and Leonardo, as April captures everything on tape. Suddenly, Donatello and Splinter arrive and Shredder’s new weapons “disappear” — they have been confiscated by the aliens. Another firefight ensues and the Space Boy’s “toy” is hit, causing the meltdown timetable to accelerate. Shredder, Rocksteady and Bebop beat feet as April jumps into the hole and removes the battery that powers the “toy” — causing the “meltdown process” to stop. April reports her story and not only does she get her old office back but she gets a three year contract as well.